I think that Ray Skjelbred, in all his varied incarnations, is too expansive for one blogpost at a time, so here — two performances by Ray and his Cubs plus Marc Caparone — is what I offered yesterday. But the urge to honor Ray while he honors the music continues today, so I present four more performances, solo piano, from that same November 27, 2015, at the San Diego Jazz Fest. “Solo piano” might be somewhat misleading. In the past seventy years, there has been some redefinition of what that sounds like. Of course, it is one person at the keyboard. But with the advent of three and four-piece rhythm sections, the idea of what a pianist might do when seated alone at those white and black keys has changed. Once, the pianist’s role was orchestral: think of Hines, Waller, Tatum — then it got pared down — from Wilson onwards to Haig and his descendants. Ray Skjelbred is not limited to any one conception of playing, but he likes to make the piano a small but legendary orchestra, all by itself. And in this solo set, he explicitly said that he likes playing “band” repertoire — songs associated with great jazz ensembles — I think not only for their evocative power (think of a magician who can evoke Louis, Don Redman, Bix, Adrian Rollini, Guy Kelly, Jimmie Noone) but for the larger space they offer, the freedom of repertoire that doesn’t arrive with its own set of prescribed conventions. So here are four beauties. Muse on them, delight in them. Observe this man and his musical transformations closely. He has much to teach us about the poetry of jazz. Feeling low? Got a parking ticket? Can’t shake that nasty cold? Worried about the bills? Did you burn the toast? It’s going to be all right. In fact, it’s already all right. Make yourself to home and listen to this music. Or — if you’re swiffing around, turn up the volume and feel the deep swinging joy this band creates. 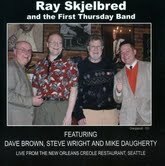 They’re Ray Skjelbred’s First Thursday Band, caught live at the New Orleans Restaurant in Seattle, Washington, on December 1, 2011. They are Ray Skjelbred, piano / leader; Steve Wright, cornet, clarinet, alto and soprano saxes; Dave Brown, string bass; Mike Daugherty, drums. And — in the spirit of the season — do you hear what I hear? I hear a real jazz band. “What’s that?” I hear someone in the back saying. Well, that’s an improvising group where all the members love the music and work together towards the same purpose, supporting one another in a gritty joyousness appropriate to the song, picking up each others’ cues, playing witty follow-the-leader so that one hears simultaneously a quartet and four strong-minded individualists taking their own path to get to their own versions of Jazz Paradise. 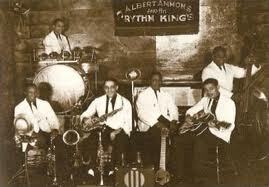 I also hear echoes of Pee Wee Russell, Rod Cless, Fud Livingston, Guy Kelly, Doc Poston, Earl Hines, Frank Melrose, Wellman Braud, Milton J. Hinton, Pops Foster, Eddie Dougherty (a relation, perhaps? ), George Wettling — all embodied on December 1, 2011, by living creators who have absorbed the tradition and made it their own. Who cares if people fight cyber-skirnishes in the blogosphere about whether “J**z” is alive or dead? Call this by whatever polite name you like: it is most certainly alive. What exquisite music — delicate and raunchy at the same time! P.S. I don’t want to be especially preachy, but I would like all the youthful musicians in the house to watch and listen closely to these clips — for the deep unspoken unity of the quartet, the shifting sound-textures, and numberless virtues. Mister Skjelbred doesn’t cover the keyboard with runs and arpeggios (unless he wants to); his left hand is integral to his playing; he could be a whole orchestra but doesn’t trample on anyone. Mister Wright knows everything there is to know about “tonation and phrasing”: not a note is out of place and each one has its own purpose, its own sound. And, children, there were ways of playing the alto saxophone that Charles Parker did not render obsolete. Mister Daugherty does so much with so few cymbals — bless him! — he knows what his snare drum and bass drum are for; he swings those wire brushes, and he is always listening. And Mister Brown, whether plucking or bowing, gets a deep resonant yet flexible sound out of his bass. Want to know what kind of amplifier he uses? It’s called LOVE. And although he can play the guitar beautifully, he doesn’t turn his string bass into one. There! I have spoken. Learn it to the younguns! Posted in "Thanks A Million", Generosities, Ideal Places, Irreplaceable, Jazz Titans, Pay Attention!, Swing You Cats!, The Heroes Among Us, The Things We Love, Wow!